Two Grad missiles fired by Gaza terrorists disrupt the calm of the Sabbath in Netivot. One woman treated for shock. 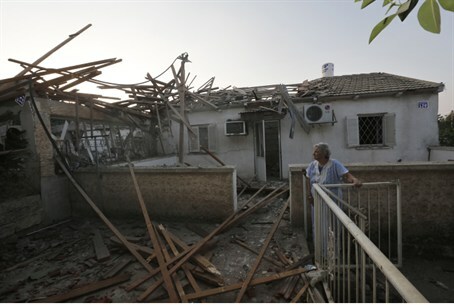 The calm of the Sabbath was disrupted on Friday evening as two Grad missiles fired by Gaza-based terrorists exploded in the city of Netivot, Channel 2 News reported. At around 7:30 p.m., residents of the city, some of whom were in the midst of their Shabbat dinner, heard the “red alert” siren. Shortly afterwards the two missiles exploded, one of them exploding in the yard of a home. There were no physical injuries or damages, but one woman suffered shock and was treated by paramedics. Gaza-based terrorists have fired more than 60 rockets at southern Israel this past week, most of which have fallen in open areas. The escalation in rocket attacks began after an Israeli air strike on Sunday in Gaza hit two Global Jihad terrorists. The terrorists responded by firing over 50 rockets at Israel during the holiday of Simchat Torah alone, with more being fired in the days that followed. On Wednesday night, IAF aircraft struck a center of terrorist activity in northern Gaza. On Tuesday night, IAF aircraft hit a terror tunnel in northern Gaza, after terrorists fired three Kassam rockets at southern Israel.